This book of essays, published in 2006, contains many of my first Christian-agrarian writings, which were originally posted to this blog (but they are no longer online). I try to remember the yearly anniversary of this blog, but I usually forget, and this year is no exception. It was June 18, 2005 when I created The Deliberate Agrarian and published my first post. Eight years have now passed and I can tell you that it has been a life-changing experience, to say the least. I figure that this blog has had over three million page views. There are 2.3 million on my current site meter and I think there were almost a million on my first site meter, which I mistakenly deleted several years ago. But this blog has never been about racking up numbers. In fact, I've purposely not done various things that would help spike my numbers. For example, I have declined numerous interview and speaking requests over the years. I'm a low-key kind of person—not comfortable with crowds and speaking in public. I might even be introverted. I'm not looking for mainstream attention. But I am driven to write. I believe I was born to write. I started The Deliberate Agrarian because I felt powerfully compelled to share my life and espouse my distinctly contra-industrial, Christian-agrarian worldview. I have stuck to that theme ever since. When I first started writing on the internet, a lot of readers wondered what an agrarian was. And the term, "Christian-agrarian," was looked at with suspicion by some Christians who came here. Like, maybe it was a new cult, and I wanted to be the grand leader. Some expressed concern that it was not right to attach the word "agrarian" to Christian. I've never argued about or defended Christian-agrarianism. I've been content to simply explain it as best I could, give examples, and celebrate it in my writings. My first year of blog posts helped set the stage for defining and celebrating Christian-agrarian life and thought, and I decided to compile several of those essays into a book titled, Writings of a Deliberate Agrarian. The book has not been a money maker, but I didn't write it to make money. God blessed me with profits from other books I wrote, and I believe He impressed upon me that I should use some of those profits to publish Writings of a Deliberate Agrarian. The book would serve to inspire other Christians to escape the dependency of modern Babylonian industrialism—to live a life more in accord with how God intended for His people to live. I might sell 50 copies of that book in a year. But the feedback from readers has been endearing. I like to say it's the least-known, best-loved book I've ever written. The name of "Deliberate" Agrarian came from, "Simple, separate and deliberate," part of a mission statement coined by R.C. Sproule, Jr. of the Highlands Study Center (now Highlands Ministries). 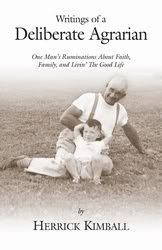 I also wrote that book to chronicle my Christian and agrarian convictions so that my children and grandchildren would, at different times of their life, read it and be edified by it. Blog readers come, and blog readers go, but there are a few of you out there who have been regular readers of this blog from the beginning, or very near the beginning. And you read The Desperate Agrarian? (published 5 days after my first post) wherein I introduced my Agrarian Vision to own more land (debt free) and work at home. That was eight years ago, and the vision was a 100% impossibility at that time. Some remarkable things needed to happen if the vision were to ever become a reality. But remarkable things did happen. No, I didn't win the lottery. No, I didn't inherit a lot of money. No, a reader of this blog did not gift me a large sum or money (though a few people along the way have graciously sent me little gifts of money). What happened is that I chose to be content and thankful for God's provision, never basing my joy in life on the attainment of my vision—but I worked hard at my little home business, and I marketed my products on the internet (often mentioning them here on this blog), and God saw fit to prosper me. He prospered me enough to buy land (debt free) about a year ago, and leave the wage-slave job six months ago.. The realization of the vision is not exactly as I had pictured it eight years ago, but it is an ongoing reality, and I marvel at it every day. To a very large degree, all of this started when I started writing this blog. So, you see, it really has been a life-changing experience. My thanks to so many readers who have encouraged and blessed me over the past eight years. I hope I can continue to write here for many years to come! I haven't been following your blog since that first day - but pretty close. I think I stumbled upon it sometime in late 2005ish. And I've followed it faithfully since then. I have really enjoyed your writing. While I was disappointed when you went to a monthly post, I grew to anticipate the end of the month when there would be an update. It has been a joy and a blessing to hear your story of both struggles and triumphs; to watch alongside and see your boys grow into men; to rejoice as you became a grandfather. Your faith and steadfastness was evident as you posted about the desire for more land, how some doors were closed, and then the joy of God's perfect timing and provision of the new (and contiguous) land you were blessed with. You have blessed many with your simple message! Thank you for sharing it. I'm a new reader, but have really been enjoying getting to know you and your site. I can relate to much about what you wrote here about blogging. It's a life-changer and a true blessing to share ideas and faith and make connections with others we never would have known otherwise. Blessing to you as you continue on! Your blog has also helped change my life as well. You do a wonderful job of communicating by writing, could call it an inspiring job. I read your little book, Writings of a Deliberate Agrarian, and thoroughly enjoyed it. Thanks for your blog, your writings, your encouragement. Keep up the contentment and the journey that brings glory to our God! We appreciate your efforts and it's marvellous to hear that God has blessed you with full time employment on your corner of the world! I've been reading for at least four years. My family has been blessed, inspired, motivated and entertained by your writings and your links. Thanks for sharing such valuable information and thoughts with us.